This morning Futures are hugely down, 1:13 (Advanced:Declining). Dow, S&P, and Nasdaq all down. This is 40 min. before the market opens. Yesterday, don't exactly remember, but it was about 6:8 or something like that with the Dow positive a little and S&P/Nasq slightly either positive or negative. 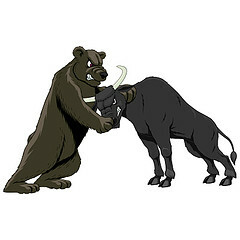 Yesterday was a huge day, and the bulls did take over, however, not without some fight from the bears. It seems my computer needs to be reboot, so I'll do so before the market opens. Hey Doris...I'm up to speed on following index futures, but sheesh...now I seem to be missing something. Where does the data come from to calculate ADV / DEC in the premarket futures? What is it measuring?